According to a Visa patent application published in April, the company sees potential to use a wide array of personal details to create profiles that could be used for ad targeting well beyond shopping details. 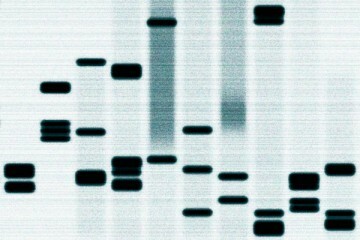 It describes the possibility of also using “information from social network websites, information from credit bureaus, information from search engines, information about insurance claims, information from DNA databanks,” and other sources. Interested in preserving privacy where privacy is non-existent? 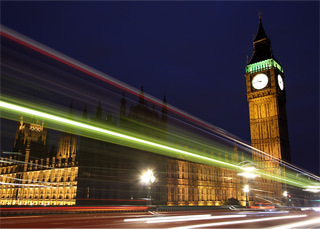 Have a look at the site of the International Association of Privacy Professionals. Or check out the Electronic Privacy Information Center. It's such a huge topic that I'll do a separate post on privacy advocates and how to (try to) get off the radar. For another report on this story, go here. 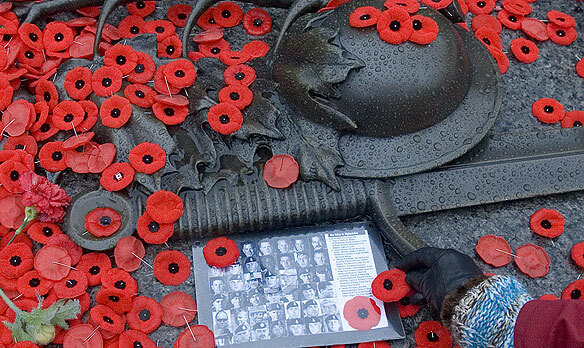 Below the jump, some music for Remembrance Day. Caption for the above image: Frontispiece to the King James' Bible, 1611, shows the Twelve Apostles at the top. Moses and Aaron flank the central text. In the four corners sit Matthew, Mark, Luke, and John, authors of the four gospels, with their symbolic animals. At the top, over the holy spirit in a form of a dove, is the Tetragrammaton "יהוה" ("YHWH"). I. In the Church service: that the cross in baptism, interrogatories ministered to infants, confirmation, as superfluous, may be taken away; baptism not to be ministered by women, and so explained; the cap and surplice not urged; that examination may go before the communion; that it be ministered with a sermon; that divers terms of priests, and absolution, and some other used, with the ring in marriage, and other such like in the book, may be corrected; the longsomeness of service abridged, Church songs and music moderated to better edification; that the Lord's Day be not profaned; the rest upon holy days not so strictly urged; that there may be a uniformity of doctrine prescribed; no Roman Catholic opinion to be any more taught or defended; no ministers charged to teach their people to bow at the name of Jesus; that the canonical Scriptures only be read in the Church. II. Concerning Church ministers: that none hereafter be admitted into the ministry but able and sufficient men, and those to preach diligently and especially upon the Lord's day; that such as be already entered and cannot preach, may either be removed, and some charitable course taken with them for their relief, or else be forced, according to the value of their livings, to maintain preachers; that non-residency be not permitted; that King Edward's statute for the lawfulness of ministers' marriages be revived; that ministers be not urged to subscribe, but according to the law, to the Articles of Religion, and the king's supremacy only. III. For Church livings and maintenance: that bishops leave their commendams, some holding parsonages, some prebends, some vicarages, with their bishoprics; that double-beneficed men be not suffered to hold some two, some three benefices with cure, and some two, three, or four dignities besides; that impropriations annexed to bishoprics and colleges be demised only to the preachers incumbents, for the old rent; that the impropriations of laymen's fees be charged, with a sixth or seventh part of their worth, to the maintenance of the preaching minister. These, with such other abuses yet remaining and practised in the Church of England, we are able to show not to be agreeable to the Scriptures, if it shall please your highness further to hear us, or more at large by writing to be informed, or by conference among the learned to be resolved; and yet we doubt not but that, without any further process, your majesty (of whose Christian judgment we have received so good a taste already) is able of yourself to judge of the equity of this cause. God, we trust, has appointed your highness our physician to heal these diseases; and we say with Mordecai to Esther, 'Who knoweth whether you are come to the kingdom for such a time?' Thus your majesty shall do that which we are persuaded shall be acceptable to God, honourable to your majesty in all succeeding ages, profitable to His Church, which shall be thereby increased, comfortable to your ministers, which shall be no more suspended, silenced, disgraced, imprisoned for men's traditions, and prejudicial to none but to those that seek their own quiet, credit and profit in the world. Thus, with all dutiful submission, referring ourselves to your majesty's pleasure for your gracious answer, as God shall direct you, we most humbly recommend your highness to the Divine majesty, whom we beseech, for Christ His sake, to dispose your royal heart to do herein what shall be to His glory, the good of His Church, and your endless comfort. Your majesty's most humble subjects, the ministers of the Gospel that desire not a disorderly innovation, but a due and godly reformation. 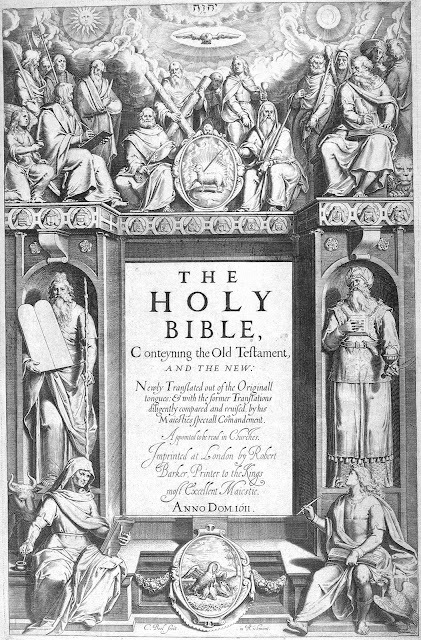 This English translation of the Bible thus reflected a desire to diminish certain Catholic rituals, beliefs and practices in the English Church. The KJV became the standard Bible in the English-speaking world by the 18th century, supplanting the Latin Vulgate Bible. You can see scans of the original 1611 edition, page by page, here. The King James Bible Trust has been putting up chapters of the KJV up on Youtube, here, read by various people who are active in British public life. Randall Lee Church didn't believe his fellow inmates when they warned him about culture shock after he got out of prison — he thought they were just jealous. But then Church, who'd been locked up since 1983, emerged into a world that made no sense. When Church got out of prison, he tells the Houston Chronicle, "I didn't know how to use computers or cell phones or the Internet. ... It was so overwhelming. I was constantly embarrassed by simple things I didn't know." As the Chronicle says, "Prices were higher and scanned with bar codes. Video games were more realistic. People were always on their cell phones. Cars had childproof locks." ... In the end, faced with a world that made no sense to him, Church burned down an abandoned house, in order to get sent back to prison. Sam Mullet outside his home in Bergholz, Ohio. Image Source: Associated Press via Daily Mail. The Associated Press reports that a splinter group of Amish families has, for the past three weeks, been attacking members of Ohio's main Amish community, one of the country's largest. Their calling card: cutting the beards off of men and the hair off of men and women, sometimes down to the scalp. The attacks are meant to be degrading because Amish women do not typically cut their hair and married men usually grow beards as part of their religion, which traditionally shuns many modern amenities. The feud is believed to be the result of unspecified "spiritual differences," according to the Tribune-Chronicle. The local sheriff, Frank Abdalla, explained to the paper just how serious the attacks are: "One Amish man told me he’d rather be dead than have his beard cut off. Local police say that several of the victims have suffered minor injuries, although no charges have been filed, largely because of their reluctance to file police complaints. Community members have, however, reached out to the local sheriff in a bid to end the violence, and investigators intend to file charges of assault and burglary, according to the AP. According to the Tribune, the group allegedly behind the violence is led by bishop Sam Mullet, who requires his follower to bring back clippings of hair as "proof" that the attacks are carried out. Attackers are both male and female, and in at least one instance have been sent to the homes of close relatives within the main Amish community. Several men were arrested in relation to the attacks in early October (for mugshot photos see here; for a video news report, go here - which includes footage of Mullet sitting in the driver's seat of a backhoe: doesn't look very much like strict 18th century living to me). The number of people arrested varies in conflicting articles. According to the Digital Journal and the Las Vegas Sun, the accused were freed on $50,000 bail which Mullet allegedly paid. There are reports that Mullet is vindictive and authoritarian. 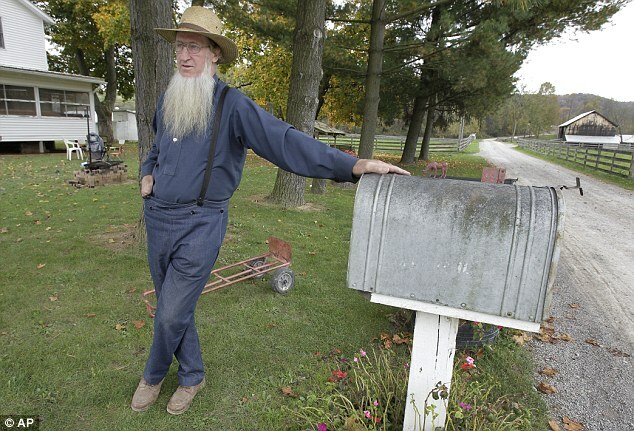 He claims that his group is acting in self-defense against neighbouring groups that he says are acting like cults; he also insists he is merely enforcing the letter of Amish law within his own community: "'You have your laws on the road and the town — if somebody doesn't obey them, you punish them. But I'm not allowed to punish the church people?' Mullet said. 'I just let them run over me? If every family would just do as they pleased, what kind of church would we have?'" But breakaway members of Mullet's group sensationally claim that he is leading a cult-type group, and they fear matters escalating up to an apocalyptic mass suicide. Here's the latest weird Millennial innovation allowing us to condense our time during the day - or something. Neatorama reports: "Put down that venti soy Americano! Don't reach for that cup of Java when you next need a caffeine hit. Inhale it instead. Behold the AeroShot, an inhalable caffeine "shot" invented by David Edwards (who previously invented inhalable chocolate) Would you um, snort one?" 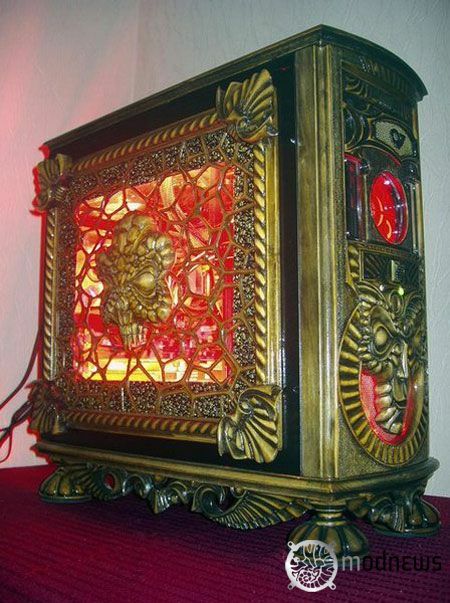 Here's another installment in my Retro-Futurism series, a cool Ukrainian gothic Steampunking of a computer tower, hand-carved in wood and hand-painted, by the man in the picture below, who is apparently Valerie Beetle from Pervomayske (Pervomaysk in Mykolaiv Oblast? or Pervomaiske in the Crimea?) city in southern Ukraine. I have not confirmed Mr. Beetle's name, but it sounds at best like a bad translation. The computer tower modification is amazing. Imagine playing the Cherynobyl video game S.T.A.L.K.E.R. with it. It looks like a tiny satanic woodstove!